(also called Clemens Romanus to distinguish him from Clement of Alexandria) was the third in succession after the Apostle Peter as bishop of Rome. Clement is known mainly for the letter he wrote to the Corinthians in about AD 96. He is counted among the apostolic fathers. His feast day is November 23 in the west, but in the east he is remembered on November 25). Clement is believed to have been named bishop of Rome in about 88 and held the position until about 98, when he died. These dates are also uncertain. Early sources noted that he died a natural death, perhaps in Greece. A tradition dated from the ninth century tells of his martyrdom in Crimea in 102 by drowning when thrown overboard from a boat with a ship’s anchor tied to him. Clement is counted as the third bishop of Rome (after the apostles). His predecessors are Linus and Cletus (or Anacletus, or Anencletus), about whom almost nothing is known. They are simply names on a list. Clement is a little more than this, chiefly because he wrote a letter to the Corinthians, which was highly valued by the early church, and has been preserved to the present day. The letter itself does not carry his name, but is merely addressed from the congregation at Rome to the congregation at Corinth. However, a letter from Corinth to Rome a few decades later refers to “the letter we received from your bishop Clement, which we still read regularly.” Other early writers are unanimous in attributing the letter to Clement. Perhaps because this letter made his name familiar, he has had an early anonymous sermon (commonly called II Clement) attributed to him, and is a character in some early religious romances (e.g. the Clementine Recognitions). 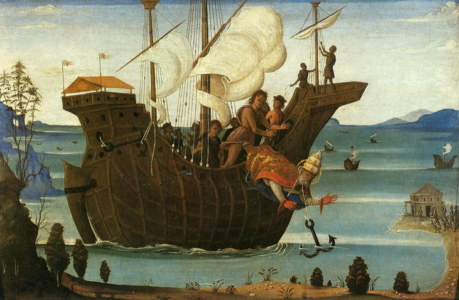 One story about Clement is that he was put to death by being tied to an anchor and thrown into the sea. Accordingly, he is often depicted with an anchor, and many churches in port towns intended to minister chiefly to mariners are named for him.